Social proof your way to e-commerce success! An idea becomes more correct when more people believe in it. The truth is that we all love to follow the crowd, whether we choose to admit it or not. This is social proof, and there are lots of ways it can be transformative for your e-commerce sales. Social proof, the psychological weapon that can propel or kill a business, it’s a force that influences every single one of us, every day. No matter how hard is to accept it, humans are pack animals. In fact, specialists say that 95% of us act as imitators, while just 5% are initiators. Social proof is validating to someone that what they are about to do is common or has been done before. You want potential customers to see that others have shopped with you in the past so they can view you as a credible place to shop for themselves. Social proof is based on the idea that someone is more likely to perform an action when they know it is aligned with what others have done or will do. 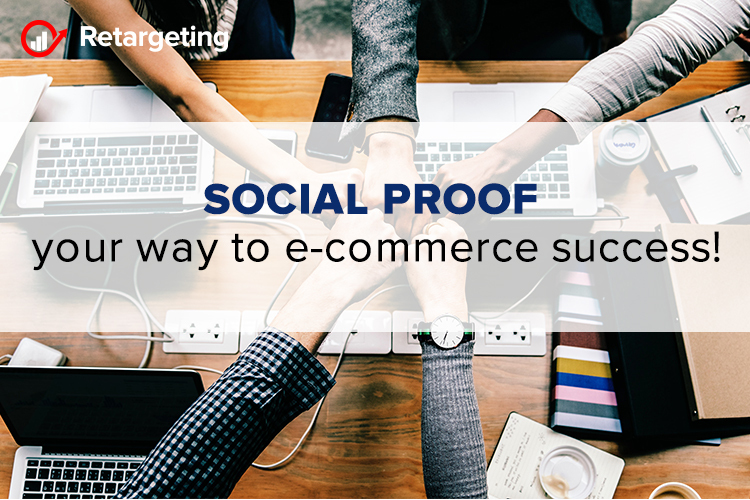 Savvy e-commerce merchants can take advantage of the power of social proof. When you help your potential shoppers see that they are part of a bigger group they are much more likely to become a customer. Reviews are the most obvious fit to gain more social proof on your site. They show your potential customers a few key things: that people have shopped with you before and that they like the products you sell. In fact, 90% of consumers say that reviews impact their purchase decision. The reason they have such a strong impact is that of the social proof they provide to your customer. Reviews are great for creating social proof, and reviews also increase your conversion rates! Encourage them: Be sure to actually ask your customers to leave reviews, many are willing but are never asked. Make them visible: Reviews are very powerful, don’t leave them hiding on your product pages. You should have them in the open where shoppers can see them. Act on them: If you got a negative review you can reach out and see if there is anything you can do. If someone has submitted multiple reviews you can reach out and thank them. Social media is another great opportunity to establish credibility and boost social proof. When a shopper sees that a product has been shared it shows that the product is well received by others. The added benefit of social shares is that expands far beyond your site. When someone shares a product they are publicly endorsing your product. If enough people are doing this it establishes social proof on that channel. This way, you to boost your sites social proof while simultaneously boosting your marketing reach. It is truly a win-win! Use the right channels: Not every social channel is effective for every store. Do some research to find which is best for your store, and encourage people to share on those channels. Share purchases: This creates an even stronger social proof. It proves to potential shoppers that others are shopping with you, not just liking products. Make shares visible: You want shoppers to see how many people have shared. Many stores eliminate the added on-site social proof when they don’t show the share totals. The king of generating social proof has to be user-submitted content. It is very hard for a retailer to fake a fan base that continually shares products and stories. That is why shoppers see user-submitted content as so credible. You can add user submitted photos to your product pages to show new shoppers just how much existing ones love your products. Another way is to have a section of your site where customers can share their own products. Identify contributors: People who are uploading content regularly can be valuable if you reach out. They may be able to provide a video review or mentioning you in forums and blogs. Monitor content: User submitted content is not a set it and forget it! You want to make sure nothing offensive or off brand is being posted to your site. Shoppers are more likely to perform an action when others similar to them have already done it or are currently doing it. Therefore you can use social proof to boost your cross-sell offers! What sounds better: Related items or customers that bought this also bought X? The second is much more compelling. This is because it is using social proof to persuade us to check out the other products. Draw attention to what others have done: If a shopper thinks that the average person in this situation would also purchase X they are much more likely to themselves. Related cross-sells: Make sure you are not just recommending random products. What you offer has to be related in some way. If products are unrelated no amount of social proof will save you. Visual recognition, the marketing game changer!